Aero Express is the only US Authorized Distributor for the Tel-Instrument TR220 Multi-Function Test Set. Aero Express will buy, sell, trade, and rent the TR-220 depending on your needs. The TR220 completely covers all your ramp testing needs in one small and easy to use package. Test capability for Traffic and Collision Avoidance Systems (TCAS), Distance Measuring Equipment (DME) and Transponders Modes A, C, Elementary, Enhanced Surveillance and now ADS-B Transmit and Receive capability including DO-260A/B requirements. The TR 220 features state of the art design. Microprocessor control and simple switch layout resulting in an easy-to-use single person operation requiring minimal training. Express Calibration is the Authorized ISO-17025 Calibration and Repair shop for the Tel-Instruments TIC TR-220. Visit www.expresscal.com for full capabilities. • Transmits DME Morse-Code I.D. • User selection of velocity, starting distance, starting altitude, and vertical speed. • Decodes and displays Flight I.D. The TR-220 allows testing of TCAS I, TCAS II, and Traffic Advisory Systems by simulating either ATCRBS or Mode S intruders. The Setup menu allows operator to configure and store 10 TCAS scenarios, including Distance (1 to 50 NMI), Altitude (-1000 to +99,900 ft.), Vertical Speed (-7,500 to +7,500 fpm) and Velocity (100 to 1200 KTS). 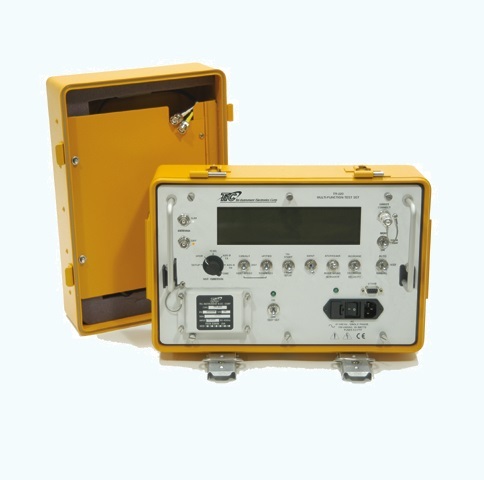 The TR-220 provides a relative measurement of TCAS power and frequency. The TR-220 provides test capability for DME by allowing operator to select test parameters, including Channel (108.00 to 117.95 MHz) and Velocity (120 to 1200 KTS). The TR-220 measures and displays DME PRF (scan rate), power, and frequency. Also, the TR-220 transmits a Morse Code I.D.